This week will be a busy one for me – all the playhouses that were selected for construction in the 2013 Life of an Architect Playhouse Design Competition will be finished and delivered. I will be posting a few more articles this week than I normally do so that I feature all the work that is going on that is associated with the Dallas CASA Parade of Playhouses – the charity event that these playhouses were designed and built to benefit. I’m currently doing M.Arch in Politecnico Di Milano, Italy. I hold a B. Arch from Hanoi Architectural University, Vietnam. Currently, I’m just focusing on academic career. 1. I’m a loyal reader of Life of an Architect. I knew this interesting competition last year but didn’t have chance to join. So I have waited for one year and take part in the competition this year. It took me about 2 weeks. I had numerous ideas but it’s really hard to choosing one which is suitable with the required criteria . Finally, I took one of them and went for developing and completing it. I recalled my childhood. I was really imaginative back then. When I was about 8 years old, I tried to build my own playhouse with anything I could find then imagined it as a house in some fairy tales. For this competition, I decided to do something simple but could stimulate children’s imagination and interest in the nature. It must be the aspect of size : how to adapt to the children’s activities and satisfy the size restriction from the requirement. Yes. I designed some playrooms and playhouses for children in a kindergarten. It means a lot to me. I had some hard time suffered from stress but this opportunity has raised me up. I felt really happy that my design was built for charity. It reminded me that we can do something small but could make the world a better place. I can never say thank you enough to Bob and all people have dedicated to this competition and this charity event. It’s a pity that I can not be there. However, I will definitely come to future exhibitions when I have chance. I’ll soon celebrate the 8th anniversary of my 29th birthday, thanks! I went back to school seven long years ago and just graduated from Drexel with my B.Arch. My background is in marketing, so a few years ago I started a business called StudioView 360 with a friend. It’s a marketing company with an architectural focus, so I get to collaborate with builders, architects, and property managers and create the images and videos they need for their print media and websites. In Philadelphia there are plenty of examples of Claes Oldenburg’s public art, and I liked the idea of taking something small and playing with its scale. At Philly’s Franklin Institute there’s also an enormous fiberglass model of a human heart, and I remember exploring it as a kid and thinking it was the neatest thing ever. That influenced my initial, abandoned design scheme — this idea of having different chambers, entrances, and exits — and I think its influence carried over to my final design. Because, you know, a human heart is just like a big block of cheese. Obviously. I remember reading a blog post by Bob where he said that these should not only be playhouses but also garden follies that can be enjoyed after the kids are grown. 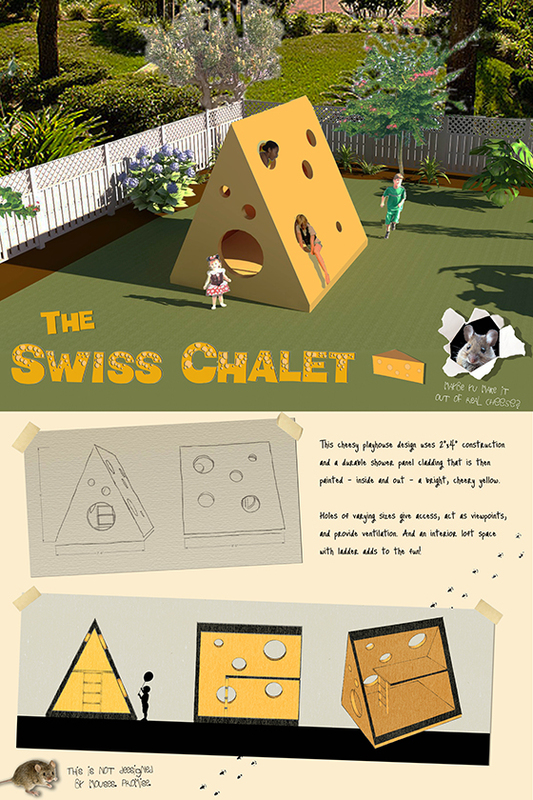 It’s a tall order to design something whimsical that kids will enjoy and that adults won’t mind having in their garden. No, but now I want to design more! The great thing about small projects is that they’re almost instant gratification. If you were so inclined, you could design and build a playhouse in a long weekend. That’s awesome! I just spent seven years in school designing imaginary projects, so this experience was just what I needed. Not only do I get to see one of my designs get built, but it will benefit kids who really need the help. It’s design that MATTERS and I hope these playhouses raise boatloads of cash! I received a Bachelor’s of Environmental Design in Architecture from North Carolina State University. This fall I will be returning for a fifth year of undergraduate study to complete a Bachelor’s of Architecture. I am not working for a firm quite yet (hopefully soon!). However, I am really interested in larger scale urban design projects that integrate architecture and landscape architecture. Then again, I like small-scale projects as well. Perhaps it is too early to tell. Well, I came across the blog a few times while searching the internet for answers to my questions about architecture as a practice and a profession. I found the competition a few days before it was due and decided to enter. The competition supports a great cause, and the playhouse designs from last year’s parade are really inspiring. As I mentioned, I found the competition about 5 days before it was due. I was also working on a studio project deadline which restricted the amount of time I could devote to the playhouse. I would estimate around 8 to 10 hours total from the concept to the board. A few ideas were bouncing around in my head at the beginning. 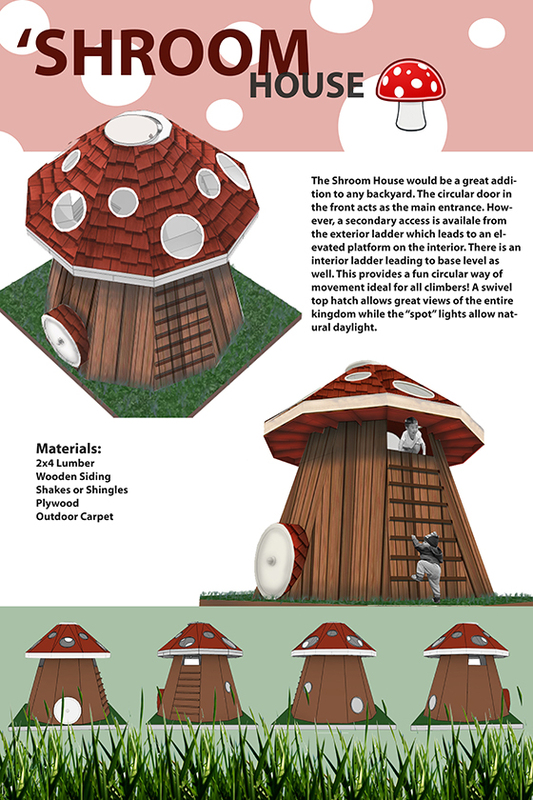 The mushroom was the only one I could figure out how to build efficiently with common materials. When I was young, my favorite games involved the imagination. I liked to pretend I was in mystical lands with magical creatures. So, a larger than life toadstool appealed to my childish sensibilities. I designed a “shack” once for a Habitat for Humanity fundraiser our school does every year. We have a large brick courtyard fronting the library where several dozen shacks are built by various university clubs and groups. We call it the “Shack-a-thon.” The shacks are made of recycled materials provided by Habitat. I designed a Japanese tea house one year for the honors program. It was incredibly fun! The total size was about 12×12 feet, I believe. It is fantastic! I am really excited to see the talents and time of architects being used to promote charities and quality of life for all people. Large building projects are brilliant, but it is great to see them juxtaposed with small-scale charity work. The breadth of work an architect can do continues to amaze me. And as a student, it is really exciting to see some of my work built. Unfortunately, I do not think I will be able to make it. But I hope everyone else enjoys the parade of playhouses! 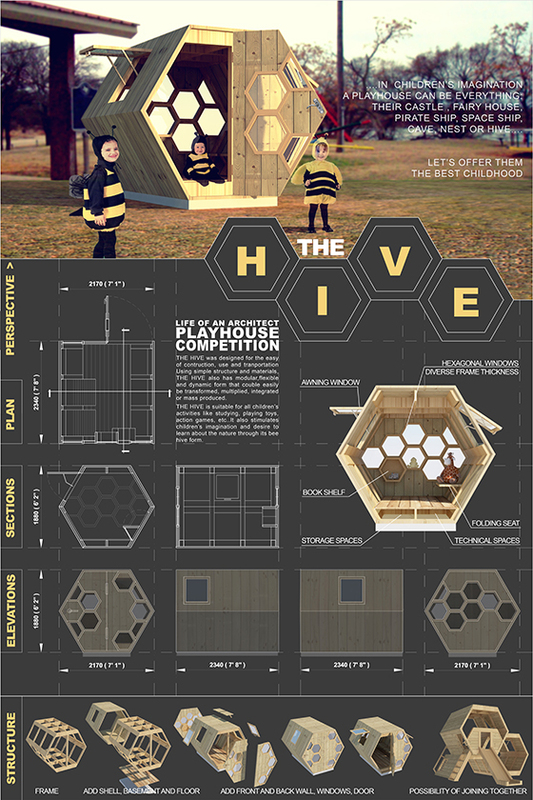 Thanks again to Thanh, Katie and Sarah for participating in this year’s playhouse design competition. Their playhouses have been under construction for the past few weeks and will be delivered and put on display this Tuesday and Wednesday. Later this week, I will post completed photographs of their playhouses. I’m quite sure they will be excited to see how they’ve turned out.